It's a transitional time for the video game division of the kingdom built by Star Wars. It's been about two years since Star Wars: The Force Unleashed II, the last full-blown game released by LucasArts. TFUII got blasted as a major disappointment and squandered the goodwill built up by its predecessor. Then, severe cutbacks to LucasArts game development staff hit in 2010 and many people wondered if the company once beloved for a robust catalog of classics would even ever make a game again. LucasArts is going to do exactly that and they're making their next game by going to the movies. Sort of. In a first for Star Wars games, the crew making Star Wars 1313 comes from all of the various divisions of LucasFilm. 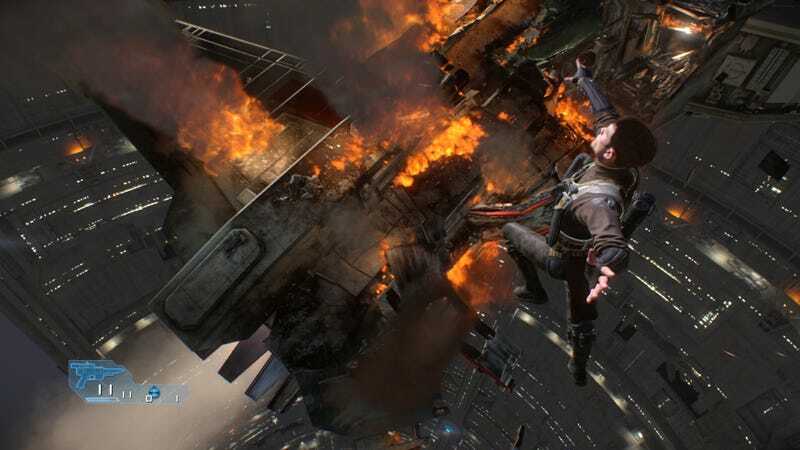 When I bluntly asked creative director Dominic Robilliard if there was anybody left at LucasArts to make the game, he answered that 1313 is being internally developed there. "We've managed to bring in some other talent from Industrial Light and Magic, and Skywalker Sound, and LucasArts Animation. But the difference this time with this collaboration is we've actually got those guys on team, using our tools, and working in our engine." This is different than previous instances where other divisions would pitch in on a game project and then go back to feature film work or what have you. "In previous games where we've worked with the other parts of the company, I don't want to say it was like chucking things over the fence," Robilliard continues. "But if you had a department working on the cutscenes, they would just do that in isolation. However, because this cinematic game relies on the experience being seamless between the gameplay and the cutscene, we brought them in-team. And when we're dealing with problems of the game, the ILM guys, or the Sky sound guys, or the animation guys, they care about how would we normally do it in a game. So they will bring in their expertise and say, "If it was a film we would probably light it like this." A behind-closed-doors demo showed actors with dots all over their faces, reciting the lines seen in the gameplay footage that debuted at E3 and wearing the same kind of head-mounted camera rigs that grabbed the facial expressions for the green-skinned Avenger in Marvel's blockbuster movie. After bringing the Hulk to life in The Avengers movie, the performance capture tech was already in place and the 1313 team didn't have to build similar tools or license them from somewhere else. Yet, the motley crew of creators still found themselves needing to learn each discipline's language. "When it comes to stuff like lighting and movement, the questions always came up of what is the motivation of the gameplay at this point? Where is your tension supposed to be? What are you supposed to feel at this moment? And then the ILM guys, or the Sky sound guys, or the animation guys can bring all of that expertise and explain how they would normally do it. All the LucasArts guys are the ones trying to make it playable and interactive in the game." As for building assets for 1313's foreboding gameworld, Robilliard says that "you've got to do it all at the same time." "It literally began with the elements of the game on the floor, like parts of an engine," he continues. "And we were like, ‘OK, where is the right place to target this collaboration? And we were talking about performance capturing and leveraging what ILM do as the very first thing. There's no point in us doing it in different spaces at different times and folding it in after the engine's been built." That kind of fragmented collaboration happens more commonly in games but was new to the ILM constituents working on 1313. "They were like, ‘Well why would you ever capture a performance in pieces?' Like it was alien to them." Alien or not, the results seen so far look promising and they may point to a new cross-divisional paradigm for making Star Wars games. Robilliard says that this interdisciplinary approach could be replicated for future games moving forward. "We came to E3 this year in probation, frankly. And the response has been overwhelming. Ultimately, the goal was to come and get people's attention, and then follow up and deliver on the gameplay aspect when people get their hands on it later on."